The Question: I’m looking for input on “student of the month” awards in kindergarten. Should all children get a turn? I’ve noticed that in my nephews class, the same group of children (about 3-4) get the award every month. I’m currently in school studying early childhood education and this seems inappropriate at such a young age. I give all students the award at least once because I believe I can find something positive to say about each of my students. Toward the end of the year I give the award to students who are showing through behavior and/or work habits that they are ready for first grade so that these students have the chance to get the award again. In my school, student of the month begins in 4th grade. The students in the lower grades watch the presentations each month but don’t participate. I use All About Me posters and have a Star of the Week. I try to have it coincide with their birthday when possible. Everyone knows that they will have a turn. 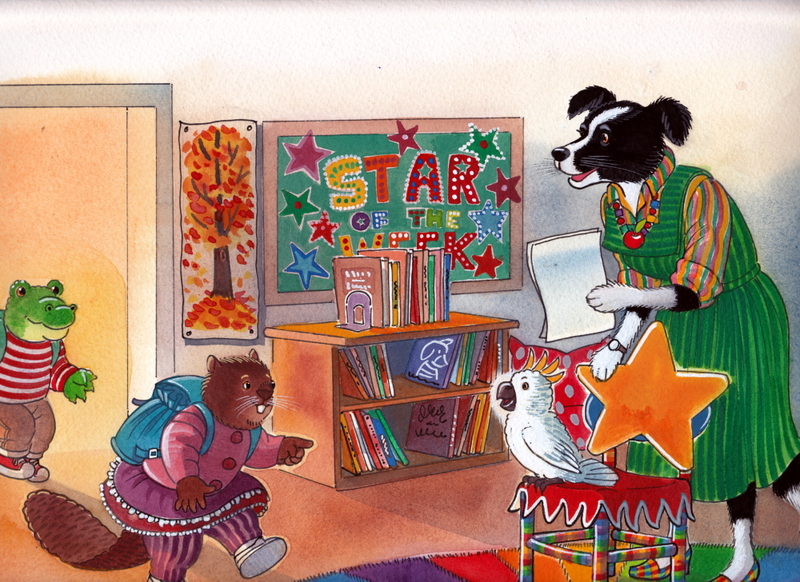 When we get a new Star, the other posters are hung on the wall and the new one gets hung in a special place after the new star tells the class about him or herself. I’m not a big fan. Very often the better behaved and academically advanced kids are selected first and those with struggling behavior/lower academics (who are often the kids who need to feel the most acceptance and encouragement in order to make behavioral/academic/social improvements) are encouraged to aspire to their peer’s behaviors. This immediately sets up your class hierarchy in a very obvious way. It is inappropriate at any age. Everyone gets a prize, or else they will turn on each other. I do not feel everyone should get an award. If everyone gets an award it kinda defeats the purpose of having standards to go by. You know as well as I do not everyone in your class deserves that award. It is hard I admit when you go through the kids that always do what they are suppose to do and wonder who to pick next. Well, to be honest it’s not that terrible to re-pick someone you have already chosen. Kids need to know that you are awarded doing the “right” things ..otherwise kids are going to get a mixed picture about how things should be. I don’t give any awards in Kindergarten. It sets limits on what they think of themselves. Instead I give praise as I see them trying, working hard, cooperating etc. I did not participate in this with kindergartners – they need to be in school and not be judged so young! We strived to have a happy, working classroom for everyone to be successful! Ann, the brain research about singling kids out for rewards or recognition at an early age isn’t very favorable toward this practice. You have a responsibility to know the research, despite personal opinions. Denise- can you post a link to some of the research you have read? So, you will find lots of articles related to the structural systems of the brain involving physiologic responses to rewards and the effect of dopamine on it, and the effects of cortisol and adrenaline on it when the perception is that rewards are withheld. Rewards for young children are most appropriately used in the intimate parent child relationship, but can promote a sense of injustice or unfairness if rewards are given to only certain chosen members in a group of young children. Research about effective use of rewards in the parent /child or parent caregiver relationship also needs to meet certain parameters to be truly effective. And yet, you can also find research demonstrating increased neural sensitivity to positive reinforcement in younger children.http://www.brainanddevelopmentlab.nl/…/van_Duivenvoorde… ….so, does it not follow that there is benefit to implementing rewards in the early childhood classroom? I agree with Ann in that rewarding for rewarding’s sake devalues the awards in general. Frankly, I’m over the “everybody gets a trophy” culture we’ve developed. It’s more important to look for true opportunities to reward each child that will be meaningful to the child. I’ve also seen specific rewarding, in my own classroom, motivate others to copy the actions of the child who was rewarded. I’m sure most of you have too. That said, I think it’s very important for teachers to look for GENUINE opportunities to praise each and every child….the child needs to have deserved the recognition, not handed it because everyone else was getting it too. I personally think young kids should be recognized for a good deed or accomplishment as soon as it happens. A month is an eternity to a 5 year old! It should not be the same few kids each time. We highlight a different character trait each quarter (K – 6 school) and different kids are recognized each time. At the end of the year, we have a Kindergarten graduation ceremony. Students receive their awards based on Perfect Attendance, Extra Effort, and behavior. If I have a child who doesn’t fit into one of those categories, I give them a Growing and Getting Better award. I am the first one to say that everyone doesn’t get a trophy, but this isn’t the same thing. Kids at this age just want some positive recognition, and we need to give it to them. When I was a first year K teacher at a private school, I held a graduation for my students. I gave out awards to each student. (Hardest worker, most academically inclined, most humorous, etc.) Looking back 25 years, I am embarrassed that I gave into that thought process. Children should not be singled out in front of their peers and given labels. It is detrimental to their psyches and supports the fixed growth mindset which does not allow people to be resilient and face challenges in a healthy way. We have a “citizen of the month” for each class k-5. There are only 9 months in the school year so I can only pick 9. I do not choose people twice. I have learned over the years (usually accurately) how to pick kids who have that ability to maintain their amazing behavior from start to finish. So I have changed my beginning of the year tactics. I start by choosing the kids who do pretty ok, but not always perfect. this way I don’t get to the end of the year and have to choose someone who may not show the desired behaviors. We also have a “go getter” award that is published in the news paper. This allows me to choose an additional 4 to 5 students a year. It’s not perfect because I still can’t get everyone, but it gets most of them. I think ALL children need to feel special. It should not be based on behavior but on the fact that they are part of your kindergarten community. The feeling that every child should ‘get’ an award has ruined the process. There is nothing wrong with rewarding children for their achievements. As long as care is given to ensure that both effort and excellence are awarded, I have never understood the “let’s give everyone an award” school of thought. Differentiate between earned awards and recognition given to everyone – for example, student of the month is earned, and the criteria shared with students and parents at the beginning of the year; everyone is student of the week at some point. If we return to the idea of working hard to earn something in this country, we will all be better off for it. We do the “Student of the Week” so everyone gets a turn. That is what I do as well… They know they will get a turn and everyone is included. At our school we have student of the month and Terrific Kid. Student of the month usually goes to those who put forth effort to make the best grades they can make. I do not have repeat recipients. I am a preschool teacher and I have been doing Student of the week. Each student gets a poster and displays pictures of him/herself, pictures of what they like,etc.. If you can’t find something laudable in a student, I don’t think that’s the fault of the child. A system in which the same students are rewarded over and over says more about the biases of the awarding adult than it does about the kids. Even though I can’t pick everyone does not mean that there are not other ways to make children feel special and like a valuable part of our classroom community. Most of us don’t need any award to achieve that. My kids all know that we are a classroom family or team. I don’t think I have ever had a child leave my classroom and feel like they weren’t important. Whether they receive the award, or not. I have a Citizen of the Day and a Star of the Week, neither of which is based on accomplishment. These special assignments are simply because each child is an important part of our community. I am going to chime in as a parent here, hope that is OK. I have a really hard time seeing the purpose of making a ‘student of the month’ award, and I find it particularly questionable for younger kids. Clearly unless you have very low class sizes not all children can get an award, and if they do it is no longer an award but a recognition. At my daughter’s preschool they have a “special little friend’ board” where they take turns bringing in pictures to show off their life and family. The kids love it, both when it is themselves and when other kids are presented. I don’t know how they choose who gets on the board, but it is not used as a reward or a goal to meet in any way, it is used only as a conversation starter to get to know their friend better. I like that system, and perhaps by doing it weekly instead of monthly something like that can be done in a kindergarten. If you make it an award and pick students based on behavior, either socially or academically, I see it potentially causing a lot of harm. The kids that do well are already the ones that probably feel good about school, they don’t really need extra recognition to confirm that. For the kids that have a hard time and hence won’t get the reward it can easily be seen a confirmation that school is not for them. They should all get an award! This is 5 year olds we are talking about and the idea of “life is not fair” is not a lesson I feel the need to teach my students at this age. They will learn it soon enough!! We did VIP and tried to coincide with birthdays. They had a board with pictures and info about them. Family invited to help share the board, bring treats on Friday. I definitely think every child should get a chance. Look for something positive in every student. I agree. If they’re going to have that program, then each and every student should receive that award. How unfair for them not to receive one! I would make sure every child gets a chance. For some of those more difficult students I find a positive thing that did and use that as a time to reward them. If a student never gets it then there is no point in trying. Only if it’s for things that aren’t curriculum-based, like compassion, or loyalty, or other characteristics that are important to instill in children. There starts to be a problem too where if everyone gets the award for the same thing, it becomes just as meaningless as if only the same few kids got it. There has to be intentionality in choosing each child for an example moment, and not just a sense of “fairness.” That actually teaches children that achievement is arbitrary and that’s not a lesson that should be taught. Instead, by highlighting unique and different qualities in each child, you can boost self awareness and self reflection while at the same time teaching their peers that everyone has different strengths and we can learn from each other’s differences. I think a more appropriate approach is Star of the Week. Each week we feature a kindergartner as Star of the Week. They bring in pictures of them and their family with a few sentences about why they’re special. They also have the privilege to be teacher’s helper during class. They wear a special crown and feel very special. When we did this, I used to make sure that I never chose the same child twice. Everyone is good at something. Your school should have guidelines as to what the student of the month award is for (academics or certain traits in character education, etc….) If there are no guidelines, it is even easier to chose someone different each month. I would explain why. I agree that it is better not to have a student of the month unless every single student gets a turn. I gave up the VIP stuff. Every day we have a “Lucky Day” person. They are the person who helps pass out things, take things to the office, etc. “It’s your lucky day, ” I say, “you get to go to the office and ask for a box of bandaids.” At the end of the day, we say three nice things about the person , give them a cheer and they get to choose something from the treasure box. They love having a chance to feel special once a month instead of once a year. We have Student of the Month, and Most Improved once a month. In my class I make sure everyone gets a turn to have one of them. I would rather not have to do this with my TK kids, but the principal feels that we need to. Should every kid on a team have a trophy simply for having joined the team?? It is inappropriate. For instance, in my kindergarten class the other day, a student won the book fair raffle because her mom bought a ticket. There was nearly a riot and a lot of tears by those (everyone else) who didn’t win. Had I been given more control of the situation, I would have kept it private. The best practice is that everyone gets a reward at the same time for the same reason, otherwise, you will not be building a classroom community that values fairness and equality. We do Student of the Week. I send a poster home in a star bag for the family to do together at home. The following week, the child brings the poster and the bag filled with whatever they want to share. Any family member, whether a parent, grandparent, aunt, uncle or even a sibling attending the school is invited to join the student’s presentation. The child shares the poster & bag contents which is usually toys, trophies, etc. and the special guest reads a short picture book from home to the class. After that the whole class sings the You Are Terrific song to the student. It is a very special time. All this takes about 10-15 minutes. The kids LOVE it and it’s a great way to get parents in the classroom. Everyone gets a turn. I pick a class teacher each week beginning in February. I always base who gets to be the teacher by picking someone who displayed a positive trait during the week. The “teacher” gets to teach the whole class about something they know about for 20-30 mins. I’ve had kids do crafts, make simple snacks, teach about chicks, plant seeds, etc. They love it and it’s their time to feel special! I got this idea from another teacher in my district. It’s a nice alternative to a traditional star of the week. I teach first grade, not K, but the fact is that some kids ARE better behaved than others. If a student puts forth effort to be a good worker, that kid should be rewarded! Not the whole class! Explain to your students what you are looking for in a winner and what they can do to be a good member of your classroom community. I teach at a catholic school where we give out awards for “virtue of the month”, for instance last months’ was Cheerfulness. It is a special thing for the student that receives the award, somebody does deserve it more than the others, and you can teach the rest of your class to be happy and congratulate the winner! Father here. I was looking for studies – either positive or negative – on kindergarten awards. My daughter’s scenario is a bit different and I would like any feedback on whether my angst is warranted or not. Below is the email correspondence between myself and my daughter’s teacher. You may want to start there to understand how the awarding was structured. Here is my problem with this scenario. My daughter does not expect to receive an award for good behavior, working hard, or begin a good friend. Often she comes home excited for other students who have received awards, but in this case, the message she received was that she and three other students (a minority) were not deserving of an award from her peers. Her takeaway wasn’t that a few were deserving, but rather a few were undeserving. And that her teacher, an individual she admires believes she is undeserving as well. Essentially, in my opinion, this teacher just set up a popularity contest with four losers. I just wanted to touch base with you regarding today’s hooray award activity. I’m not sure exactly what occurred and I am hoping you can clarify it for me so that I can talk to Melissa. Melissa came home from school very upset. She explained to me that every student was given an award to give to another student. She then said that she was one of only four students who did not get an award. She is really distraught over this because she believes that her behavior matched the required behavior for an award. Can you please let me know if this is what happened or if I’m missing some key facts? I give out Hooray awards quite often. I wanted to give my Kinders an opportunity to look for other Kinders in our class following our school rules and then to give those Kinders one of the awards. When I hand them out, I tell Kinders that not everyone gets one every time. The expectation is that Kinders are ALWAYS following the rules. I do not give an award every time I see a Kinder following the rules. Yesterday, I gave each Kinder a Hooray Award and told them they should find one Kinder to give it to over this week. Unfortunately, that means not every Kinder would be given one because it is up to the Kinders to pass them out. Melissa is an amazing Kinder. She works hard, she is sweet, and she is a good friend to others. It is good for her to know that she is deserving, but to understand that she will not always get an award for doing what is expected. There will be plenty of opportunities to continue to earn Hooray awards from me throughout the rest of this year. I am sorry that she felt disappointed. This is an important, and controversial topic.Okay for me to post your exchange with teacher anonymously on Miss Bindergarten’s Facebook page–where teachers go to respond to queries like yours? Thank you for your thoughtful comment. I agree with your opinions. Alright, everybody. Let’s do a bit of a reversal here. How about the teachers getting a teacher of the month, given by the principal, or the PTA? Anybody know a principal who plays favorites? How about the teacher who is open and honest with parents, and just gave fair, but difficult grades to the PTA President’s child? What about the teacher who is very popular and pretty, but just hands out worksheets, repeating the same, old, dry stuff, year after year, but somehow keeps getting the teacher of the month award? What about the teacher who bucks the system and is collaborative and innovative? Does she get the award when she defies the powers that be? Oh wait. This does happen. “And we love the way it works,” said nobody, ever.